Since the Air Force instituted new physical training standards two years ago, the number of airmen discharged for failing to meet physical standards has skyrocketed, according to data provided to Air Force Times. Read about how many airmen are getting kicked out and what people have to say about it. 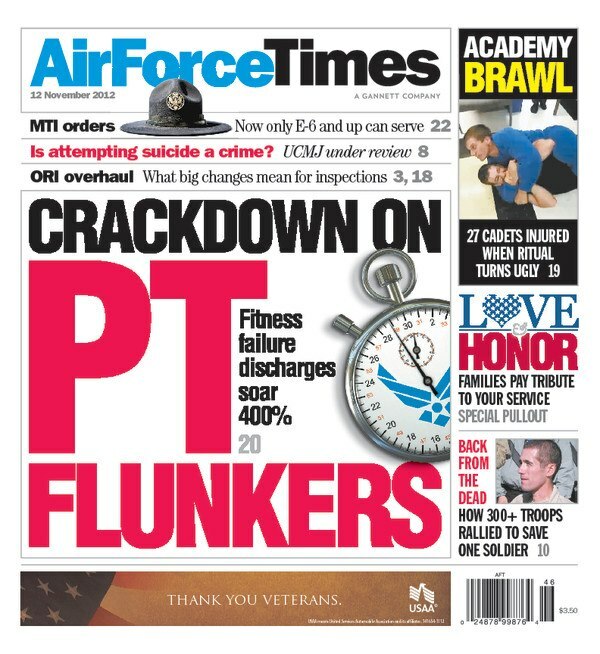 Also in this week’s edition: Staff sergeants may soon be ineligible for military training instructor duty as the Air Force struggles to cope with an ongoing investigation into misconduct by trainers, most of whom are E-5s. One change included in a report set to be given to lawmakers would require that airmen have to be at least a tech. sergeant to serve as MTIS. That would mean that nearly half of the current trainers would be too junior to serve. In other news, the Air Force is looking to overhaul operational readiness inspections three years after it ramped up ORIs – and handed out the most unsatisfactory grades in a decade. You can read the five things you need to know about the new system. And MC-12 surveillance aircraft could be used to provide real-time intelligence during natural disasters in the United States, Lt. Gen. Harry “Bud” Wyatt, chief of the Air National Guard, said during an Oct. 31 interview with “This Week in Defense News” host Vago Muradian. The Air Force wants to transfer all 42 of the aircraft to the Guard, but that has been caught up in the standoff with Congress over the fiscal 2013 budget. Waist measurement is unfair to tall people. It should just be performance based. UNFAIR!